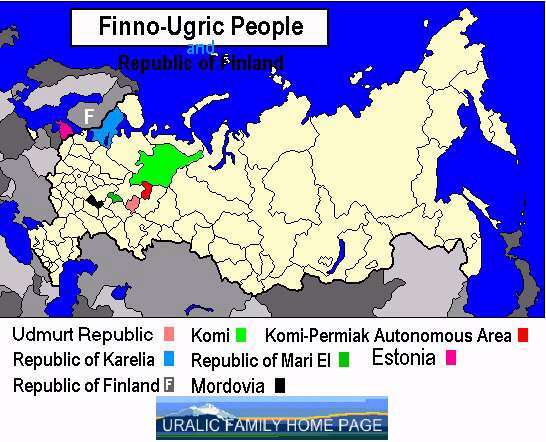 The above map shows 8 of the Finno-Ugric Republics that have common Finnic language roots. Due to isolation from oneanother, however, their languages developed separately and acquired different loan words. For example, the Finns say "terve" (health) "hello," while the Mari say "salam." Interestingly, the further north and west one goes, the closer the language resembles Finnish, while the southern languages, whether in the Baltic or Urals, are more unintelligable. Presumeably, this is due to influence from southern contact, while this is minimized in the north. The Finnish tribes were often distinguished from their Slavic neighbors by their cleanliness. Slavs moving into the villages brought hard liquor and were accepted for awhile until their friends and relatives moved in bringing gifts of vodka. Drunken strangers in the village were soon shunned. This resulted in the eventual moving away of most of the Finnish population because the situation became intolerable. With Russians in the village, there could be no peace. As the map shows, the Finns were driven east, north and west, and the Republics they formed in Russia were isolated from one another - a form of divide and conquer.